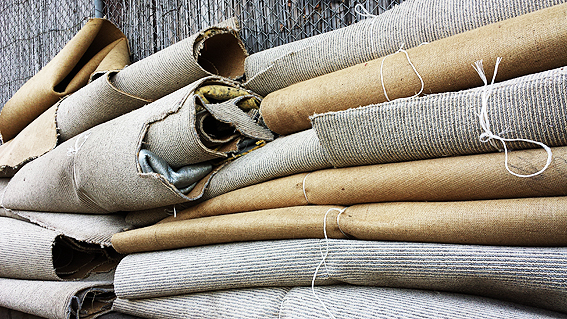 Carpets are another of those non-rigid, non-boxy type discards which offer an infinity of possibilities. Rather like futons and bean bags, there is something beguilingly protean about dead carpets, to the extent that, at different times and in a certain light, they can truly be said to resemble something which has simply curled up and died in the gutter. Indeed there is already a close cultural association between carpets and death given that the rolled-up rug is often used in crime drama (and real-life crime?) as a means of hiding and disposing of the body. One can almost imagine a stiff being tucked away in some of these examples, a double death so to speak. 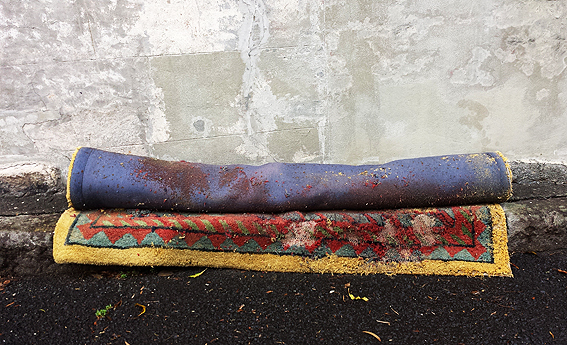 Unlike other discards, the dead carpet never appears as it does in real life. Imagine that! The byways and highways would soon be covered in pile and weave, a patchwork of rugs and remnants. In fact every dead carpet lies somewhere along the continuum between these two states and may easily combine both Fold and Roll in the same instance: Folds that look as if they are Rolls undone, and Rolls that possibly began life as Folds. Where one begins and the other ends is hard to tell at times and it is this malleability which contributes so much to the sheer heterogeneity of unwanted carpet. As such, the dead carpet is the Sublime made manifest, uninhibited, limitless, an excess of form that is beyond comprehension, extending outside the bounds of what is necessary in order to be understood as carpet.